Wanco Security & Surveillance provides quick-and-easy wireless remote monitoring. Access cameras and sensing devices from the home office, a command center or on-site. Keep an eye on all your properties, any time, from anywhere in the world. 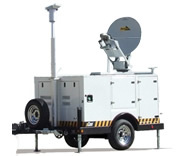 The pCom™ 300 provides an immediately deployable, self contained power generator, lighting and communications infrastructure where you need it. Emergency response and field operations requires infrastructure designed to solve the problems that come with the unknown. Disasters can happen anytime hurricanes, floods, etc. Any of these situations can cause Drinking Water supplies to become unsafe. 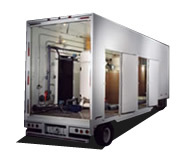 A Mobile Emergency Response Filtration System (MEFS) from Separmatic Systems can reach virtually any affected area quickly. More than just a barrier, the Silver Eagle RapidWall mobile barrier offers fast, effective protection for responders and the public. 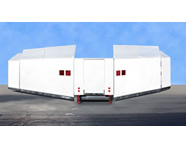 The RapidWall is deployed directly from its own SUV-transportable trailer, erecting a 44.6’ wide x 10.8’ high full-protection blockade in just 2 minutes, using two personnel.